Gamersyde has recorded some off-screen gameplay of the KINGDOM HEARTS Birth by Sleep 0.2 -A fragmentary passage- demo from TGS 2016. This is the same demo that was originally playable at E3, but boasts a number of updates made by the development team since then. The most key difference are the changes made to the overall lighting, as well as textures for the character models of Aqua and Terra. Looks really good, the enviroment is beautiful and the models look nice. Terra looks alright now, at least to me. That really is a great improvement. 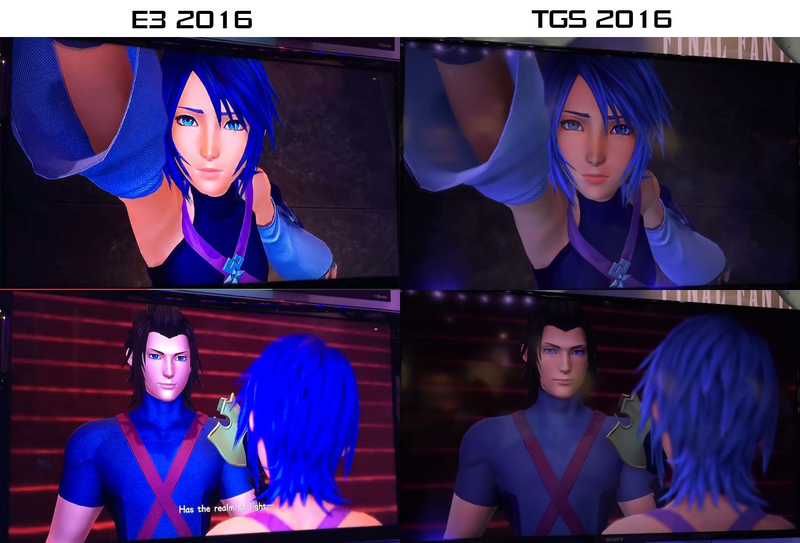 This just made me excited for the next showing for KH3,if they can make improvements like this in a few months i wonder how much of a difference a 1 year would do for KH3. We honestly don't know how long it took them to make this improvement. We don't know when they finished the E3 demo and we don't know when they finished this. I do agree it looks better. Now they only lack facial features a little, but I don't mind too much. I think it looks a LOT better. I wouldn't say its perfect or anything but its clearly a very nice improvement over the original demo. Holy hot Terra batman! Props to the dev team for the awesome improvements in lighting! Me to TGS Demo Terra: Hey there handsome. Oh Terra. Your beautiful eyelashes are back, and I am satisfied. The improvement! Ahhhh they're are bustin butts over there! I thought there was drastic improvements since I didn't really have time to think about how plastic anyone looked (aside from that one shot of mickey). OT: The gameplay looks a lot smoother now too. Doesn't look like she's moving around at the speed of sound anymore. A bit more grounded, save circumstance. It's not like the lighting makes him smarter, so no, you're def. not alone.